The monthly global magazine for polymer compounders and masterbatch producers. Covering plastics, additives and compounding technology and market trends. 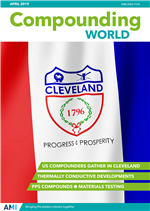 Compounding World is a digital magazine from Applied Market Information that is specifically written for thermoplastic compounders and producers of masterbatches (or color concentrates). It covers the latest twin-screw and single-screw extruders, mixers and pelletizers, as well as innovations in additives and materials.